I’ve been reading opinion pieces questioning the continued U.S. military involvement in Afghanistan. Reasons given by the administration don’t make common sense, in many minds. 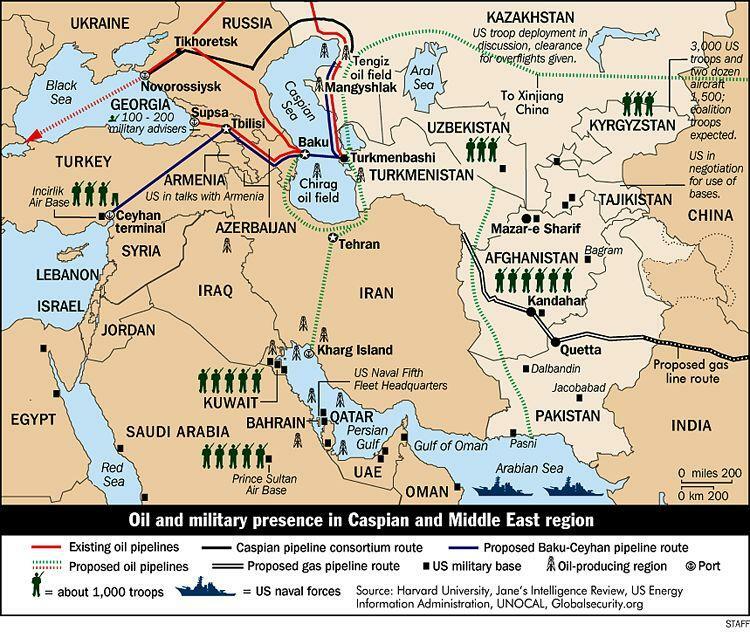 For the last year or so I’ve been looking at this situation from a different perspective: “Follow the oil.” (See previous entries on the Caspian Sea.) Here’s an article from UPI online dated August 5, 2010 that adds to my interest. MOSCOW, Aug. 5 (UPI) — The Turkmenistan-Afghanistan-Pakistan-India natural gas pipeline, first proposed in 1995, is back on the drawing boards. The TAPI technical working group’s executive committee — originally the Trans-Afghan Pipeline, “TAP,” now “TAPI” with the inclusion of Pakistan and India — stated that construction of TAPI could maintain and strengthen political stability throughout Central Asia, including Afghanistan, Itar-Tass reported Thursday. Stretching 1,043 miles from Turkmenistan’s Dauletabad gas field to the northwestern Indian town of Fazilka, the $3.3 billion pipeline’s annual throughput of 33 billion cubic meters will be delivered to consumers in Pakistan and India after transiting Afghanistan. Despite the ongoing turmoil in Afghanistan, in 2005 the Asian Development Bank financed technical feasibility study. The project has a long genesis. In 1996 a memorandum of understanding resulted in the establishment of a consortium led by Unocal, the Central Asia Gas Pipeline Ltd. A Taliban delegation subsequently visited Unocal headquarters in Texas and in January 1997 the Taliban approved TAP’s construction. Afghanistan’s current President Hamid Karzai at the time worked for Unocal. Whatever chances the project had were set on hold in the rising chaos in the aftermath of November 2001’s Operation Enduring Freedom, which quickly drove the Taliban from power, invalidating the arrangements. Despite Karzai’s persistent support for the project, security of TAPI’s route through Afghanistan remains a major impediment to the project’s realization, though in 2008 the Afghan government made several pledges to relieve those concerns. As the Obama administration is continuing its predecessor’s policy of containment and isolation of both Russia and Iran, TAPI is currently the most significant undeveloped southern output project for Central Asian natural gas and oil. A problem with TAPI that has yet to be addressed is whether Turkmenistan will be able to provide the required throughout, should the natural gas pipeline be built. At present Turkmenistan exports pipeline gas to China, Russia and Iran. In 2006 Turkmenistan produced 62.2 bcm of natural gas, second only to Russia. With 2005 domestic consumption estimated at 17.07 bcm, approximately 45 bcm, or more than two-thirds of Turkmen production, was available for export. The three above-mentioned countries now account for virtually all of Turkmenistan’s exports for the foreseeable future. Most notably, recently a Turkmen-China natural gas pipeline agreed in 2006 capable of handling up 30 bcm annually came online, providing an export route for Turkmen natural gas exports for the near future. How TAPI, which at present would be constructed through a war zone, could compete with Turkmenistan’s pre-existing markets in China, Russia and Iran remains to be seen.